A firewall by its very definition is, “any barrier that is intended to thwart the spread of a destructive agent.” When it comes to your Mac, that “destructive agent” is anyone on the Internet or your local network who wants to gain unauthorized access to your computer and data. DoorStop X Security Suite is a collection of three tools designed to leverage your Mac’s built-in firewall, help you understand how others are trying to access your computer, and to help you understand how to keep your Mac secure. Your Mac has a great built-in firewall that, chances are, you have no idea how to manage or use to full effect. Sure, it’s easy enough to open the system preferences Security pane and turn on the firewall, but once you’ve done this it’s not always obvious what you are and aren’t securing. Doorstop X puts a better, easier-to-understand face on your firewall, making it more likely that you’ll protect your Mac while still leaving necessary services available. Part two of Open Door’s security suite is the Who’s There application, a program that makes your firewall’s log files understandable and that can also help you to troubleshoot issues you may be have trying to connect to your computer. Who’s There gives you several options for viewing the log data, displaying either a complete history, a summary by IP address, or a summary by the service being accessed. Double-clicking any item in the list displays specific information on the service being accessed, allows you to search the Internet’s WHOIS database to see who may be trying to gain access, and displays a map of where the attack may be coming from. Better yet, a Change button takes you back to Doorstop X where you can make changes to the level of access allowed for that specific service. I found this particularly useful when I was trying to sync the information I keep stored in SplashID on my iPhone and Mac. Initially, after installing and DoorStop, I could no longer sync the two databases. This is because DoorStop proactively blocks access to everything on your Mac unless you specifically tell it not to. Using Who’s There I was able to see what port SplashID was using and then open that port so that I could sync my data. Finally, the DoorStop X Security Suite ships with a comprehensive guide to securing your Mac called Internet Security for your Mac. This guide has now been updated to reflect changes made to the Mac OS with the release of Snow Leopard as well as detailed information on how to make sure your iPhone and iPod Touch can be made secure in the Internet. 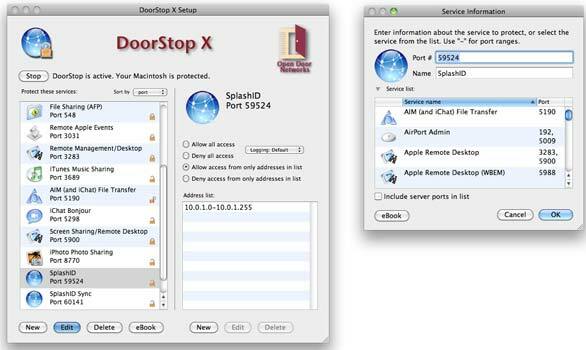 DoorStop X puts an understandable, easy to manage front-end on OS X's existing firewall. Your Mac already has a firewall, but the DoorStop X Security Suite makes that firewall more accessible and easier for the average user to take advantage of. Easy to set up and use, the combination of DoorStop X, Who’s There, and the Internet Security Guide will help you to secure your Mac and gain an understanding of how and why your Mac should be secured.